Oct. 17, 2005 — Novotel Ambassador Gangnam is becoming more aggressive than ever in getting closer to its guests. 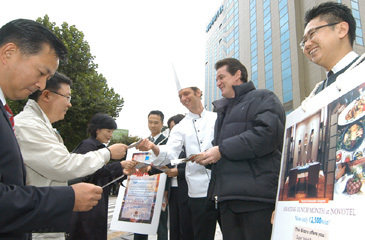 On the morning of Oct. 13, 2005, general manager of Novotel Ambassador Gangnam, Mr. Jerome Stubert, and the heads of departments, were on the street handing out advertising fliers to passers-by en route to work to show them their new proactive approach in attracting potential guests. The hotel, widely recognized as one of the top urban business hotels in city, has adopted a new sales marketing strategy upon its recent appointment of a new general manager, who came up with the idea of going out on the street to start it off. The general manager, a veteran of the hotel industry has devoted most of his career to French Accor Group. He plans to put the emphasis on frequent communication with guests in order to better improve the hotels' reputation and, thus produce higher outcome from its operation. The hotel is now under the new commander and will not just wait for guests to step into the hotel, but will approach them directly. The morning sales campaign was targeting mainly office workers in the district for the special discount promotions on offer at it's European Restaurant "The Bistro" and Entertainment Bar "Gran*A." The Bistro, known for its comfortable interior setting and quality service with reasonable prices, is noted as one of the city's favorite places to lunch by offering its lunch combo menus at 12,500 won (50 percent off the regular price, tax exclusive) for weekdays in October. Gran*A, a frequent destination for urban office workers for light beer and snacks, offers "Happy Hour" from 6 to 9 in the evening at only 15,000 won (tax exclusive) for unlimited beer and wine. (Information: 531-6604).